Kleefeld on Comics: On Webcomics: Give Yourself Some Credit! It's a decent strip that I try to follow, but there's no RSS feed to it, so I have to rely on seeing Guigar tweet about it, which I don't always catch. So I only wind up reading maybe one out of every four or five strips. Do you happen to notice anything different between the two pieces? Tales from the Con has a line of text underneath the strip providing the name of the strip, the creators, the copyright, and the convention URL. ECCC has none of that; I haven't stripped anything out. The creators are only listed on the initial page, the title and copyright are in the HTML of the original page the art is embedded on, and the convention URL is entirely absent. So if I hadn't told you who worked on the above art, or where it came from, you would likely have no ideas about anything about it. If it happened to go viral because someone posted it on Twitter or Facebook? Again, you'd have no idea where it came from. A lot of creators don't include any information on their art, so that isn't terribly unusual in and of itself. I'm sure it's just not something that occurs to a lot of people, and I expect many others think it's a good idea but just happen to forget because they're trying to get the comic done in time. Still others may feel it's not worth the effort because those rat-bastards on the internet are going to strip it out anyway, so what's the point? All that said, though, I think it's particularly unusual in this instance. 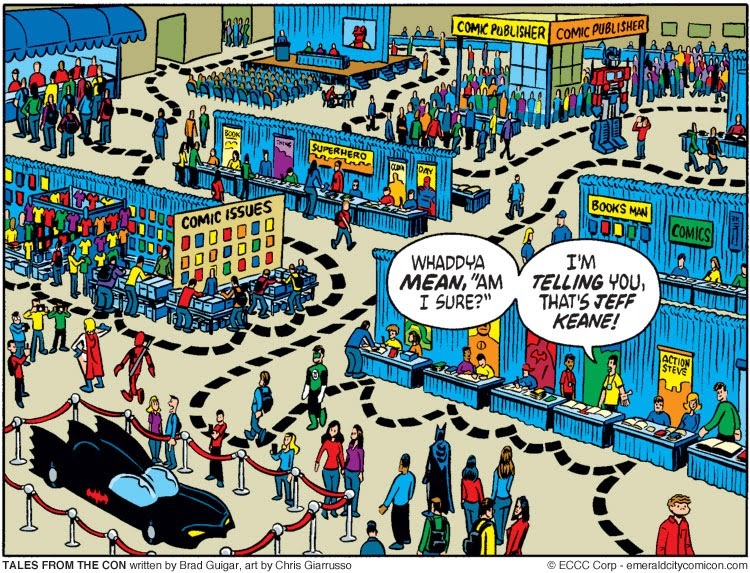 In the first place, ECCC is being shown up alongside the longer-running TftC, so it's odd that it wouldn't take some more cues from that strip. In the second place, the guy who does the final art for TftC and puts that info in place for that strip is one of the writers for ECCC! You'd think Giarrusso would pull Thompson aside at some point and just say, "Hey, man, slap some credits on those art files, wouldja?" Thanks for the kind words about TFTC! And I have good news for you -- it's not just something we do for the three months leading up to the show. We do it every week. In fact, we have enough archive that Emerald City has printed a 32-page comic book that's going to be available at the show this year.